business acquisition and disposal marketplace. 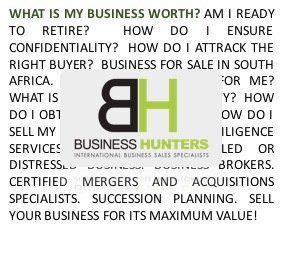 Business Hunters International (Pty) Ltd is a lower to middle market mergers and acquisitions and high end business brokerage firm that specialises in the sale of privately held businesses. We are recognised leaders in our industry and have a strong network of investors and professionals to serve the needs of our clients. We would be happy to provide you with a free and confidential evaluation of your business as well as advise you on steps you might take to enhance the value of your business for a future sale. We are industry experts at what we do and know that we can help you sell your business for it’s maximum value. If you have any questions or interest in discussing our proven strategies for selling or growing your business, please contact us today for a free no obligation evaluation. Selling or Buying a Business? 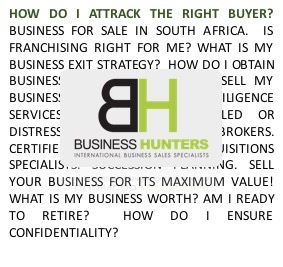 Business Hunters is your key to success. 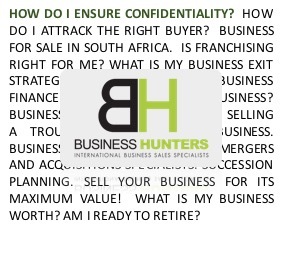 Business Hunters is a full-service professional business intermediary firm specialising in all aspects of the confidential sale, merger, acquisition and valuation of privately held mid-market companies. 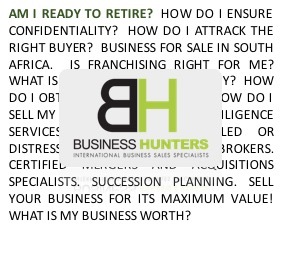 Business Hunters brings extensive, broad based expertise, yielding the greatest probability of a successful sale with a maximum net after-tax yield. 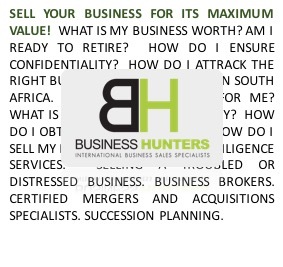 Your business is one of your most valuable assets, so deal with the leading business sales specialists in South Africa. Do you want to sell your business? Do want to know how much the business is worth? Do you have many of legal and financial questions? Are you concerned about confidentiality? Alongside our industry-leading practices coupled with certified business brokers and merger & acquisition specialists, the team at Business Hunters are seasoned specialists in guiding business owners through the business sales process. While selling your business can be a complicated process, it doesn’t have to be frustrating. We provide step-by-step guidance and expertise to help you get it right! We attend to many practical and financial details, from determining a realistic price, preparing your business for sale, finding the right buyer and negotiating the best deal. Business Hunters – middle market team can assist you in selling your business for its maximum value through our unique Value Maximiser Exit Programme. For the effective sale of a high value business, a standard business-broker approach is insufficient. You need need a professional, hard hitting merger and acquisition specialist who can partner with you and assist you to transition easily and efficiently, and maximise your profit. The assessment, valuation procedures and marketing approach is much more detailed and intensive and requires the hands-on expertise of a number of professionals. Let the professional merger and acquisition team at Business Hunters partner with you and guide you through this process. 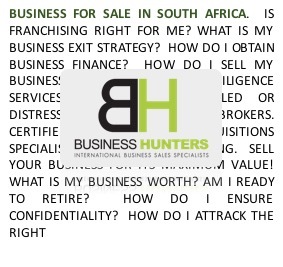 Business Hunters is renowned for their professionalism and expertise, and and is proud to be the merger and acquisition partner of choice for a number of top-listed companies in South Africa and abroad. We are Certified Merger & Acquisition Professionals – Kennesaw State University, USA. Business Hunters provide services to various qualified acquirers including private, corporate and strategic acquirers and private equity groups. Business Hunters typically has 50+ businesses in the process of preparing to enter the market to sell or actively on the market for sale. Business Hunters – Acquisition Search Program (ASP) represents qualified acquirers interested in buying a business. The programs identify platform companies and/or add-on acquisitions exploring options to revenue enhancement, cost reduction, expand into new markets, build economies of scale or improve services to customers. With the emphasis on quality and innovation, Business Hunters deliver highly successful outcomes to our mergers and acquisitions clients. Business Hunters is the country master franchise owner for Franchise World Link for both South Africa and Mozambique. If you are a franchisor and you want to sell a country master, Franchise World Link will help you in the negotiation process. If you are an investor that wants to buy a franchisor or a master franchise we will help you. If you are a franchisor or a master franchisee and you have an exit strategy, Franchise World Link will contribute to find the right investor. Unfortunately, things not working out as planned, is a reality of life. If you find yourself in this challenging situation, allow Business Hunters to assist you to professionally and legally dispose of your business fast and efficiently, so you can meet your obligation to your creditors and minimise your losses. You don’t necessarily have to be at the mercy of the wolves at the door! Business Hunters can assist you to extract yourself gracefully and efficiently, and possibly even help you into your next venture. Contact Business Hunters to find out more about our professional and confidential ‘Business in Distress’ management process. An exit strategy is a plan for transitioning management and/or ownership of a business to another entity, to shareholders through transfers of ownership or to other family members. Without a well-conceived business strategy, the value of a business may not be emphasised properly and exit options can become limited. The range of business strategies to be considered can include a straightforward sale of a business, to more intricate transfers of ownership such as an employee or management buyout. Joint ventures and strategic alliances, or streamlined sales of assets can also be evaluated. Many issues have to be addressed in order to maximise a business’s value, including business, economic, personal, interpersonal and cultural aspects. No two business owners will weigh these issues alike; the choice of an exit strategy must be based on the individual owner’s assessment of the importance of each issue.